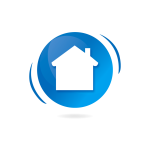 Real-time and on site measurements of indoor air with a broadband detection analyzer. 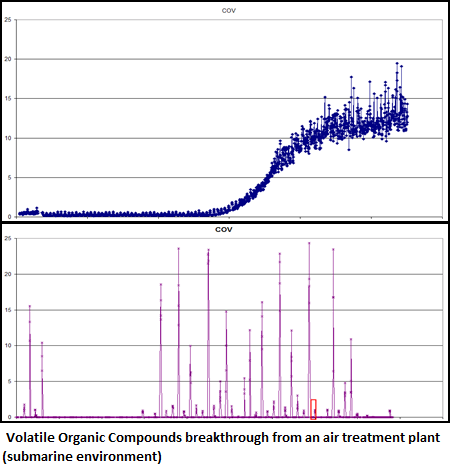 Measurement of continual and one-time emissions in indoor air and characterization of remediation methods. Studies have demonstrated that indoor air is even more polluted than outdoor air and has devastating effects on health. This is an important concern in that we spend around 80% of our time in closed or confined spaces: homes, offices, schools, transportations and so on. Indoor air quality degradation results from materials such as paints, glues or woods; emitting low but continuous concentrations of chemical pollutants. Containment increases the pollution in confined spaces, leading to an indoor air two to five times more toxic than outdoor air, according to the American Environmental Protection Agency (EPA). This pollution triggers a “Sick Building Syndrome” that increases allergy cases, attention difficulties, repetitive headaches and so on. Besides, studies are also making the connection between the indoor air quality in offices and work performance or absenteeism. In order to fight against that phenomenon, regulations are implementing higher measurements standards. Indoor air quality has to be measured and remediation equipment (photocalysis, cold plasmas, new additivated materials…) should be characterized. It requires adapted analyzers easy to carry on site, detecting a great number of chemical pollutants (for screening studies) and allowing fast quantification: BTrap analyzers perfectly fit those needs. There are many possible emission sources that can deteriorate indoor air quality in workplaces, whether it be during a process in an industrial environment, in a lab or in an office. 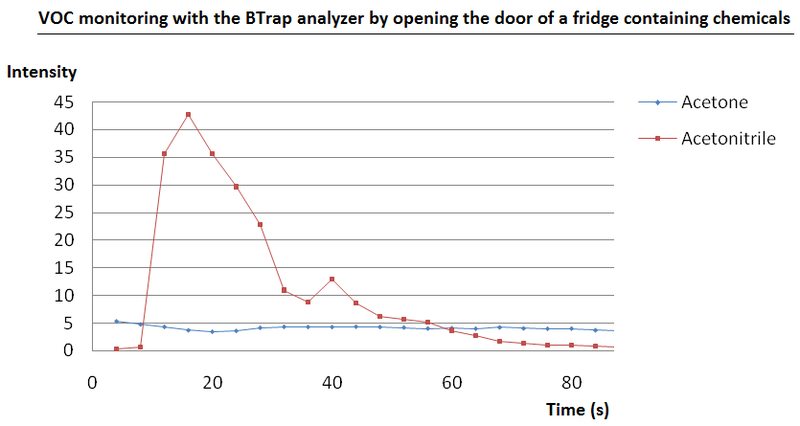 BTrap indoor air measurements are particularly interesting in case of one-time emissions: emissions occurring after a particular event such as opening a fridge containing chemicals, or during solvent filling in a distillation column in an organic chemistry lab for example. For instance, a test was performed on the first opening of a fridge door that has stored closed bottles of chemicals all night long. 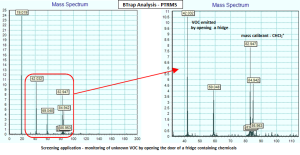 The release of a compound was detected. According to exact mass determination, it was identified as acetonitrile C3H3N. This emission lasted only some twenty seconds: this kind of analysis requires a real-time measurement with broadband detection. 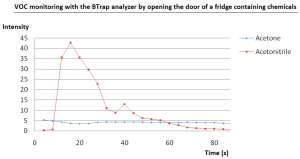 Analyzing those one-time emissions in real-time and on site with the BTrap provides a better understanding of health risks due to activities surrounding a workstation. 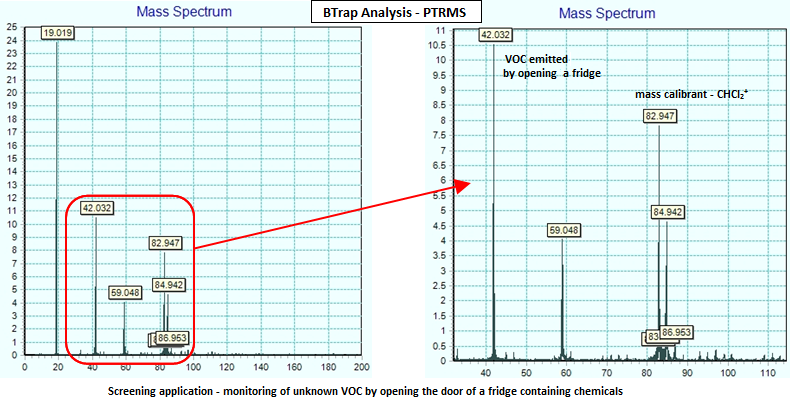 This measurement complements standards measurements requiring sorbent tubes sampling for 8 hours, since BTrap analysis highlights acute toxicities unlike standards measurements that emphasize chronic toxicity. Many methods and devices have appeared for indoor air pollution treatment. Some are based on photo-catalysis, others are using cold plasmas, eventually coupled with catalyzers or using new materials with specific adsorption properties. In all cases, the challenge is the destruction or the complete collection of pollutants potentially present in indoor air. Analysis of the degradation products is necessary for optimizing, controlling and evaluating those systems. Here again, on-line analyzers with broadband detection are essentials. 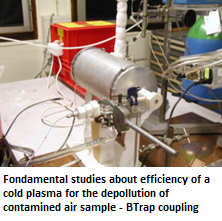 Several measurement campaigns have been carried out in collaboration with the LPGP (Laboratoire de Physique des Gaz et des Plasmas) and the LCP (Laboratoire de Chimie Physique), by coupling a BTrap analyzer and a non-thermal plasma reactor (“cold plasma”). The aim of those studies was to characterize the degradation mechanisms of pollutants introduced in the plasma, by real-time analysis of the discharge effluent mixture. These molecules were: isopropanol, toluene, acetaldehyde, 2-heptanone. 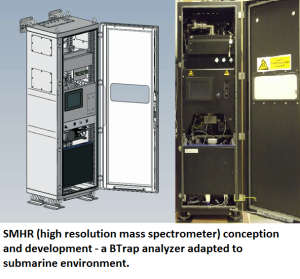 Our team has developed a tailored BTrap analyzer that can be integrated inside a nuclear-powered ballistic submarine. This device is currently used in measurement campaigns on shore, assessing the efficiency of the plant in charge of pollutant removal (EDP, Elimination Des Polluants) that will be used in nuclear attack submarines guaranteeing ambient air quality. Those air remediation plants incorporate several treatment stages. A multiplexing system is used to sequentially measure the gas present at seven sampling points. In this way the efficiency of the different filtration elements of the plants are tested in real time. The blue curve shows the increase of a particular compound at a test point occurring when one of the filters has reached a saturation level. Reemission of compounds during heating of specific elements can also be monitored. The remediation process can therefore be adapted and optimized.